What IS The Artists' Mark? Since this is a rather odd name for a shop, I am often asked the question in the title. First, I'll clear up a few misconceptions. My name isn't Mark (it's Peter). Also, although the shop is only about 200 square feet, there is a lot to see. 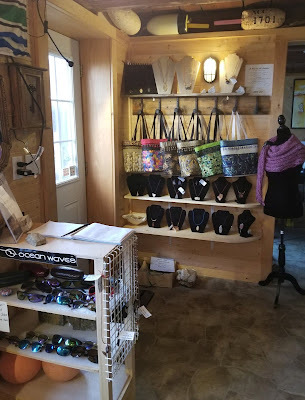 The shop gets its name from the fact that pretty much everything we sell is hand made. Thus it shows the mark of the artist- tool marks, brush strokes, variations in shape and colour- all the things that make a piece unique and something that is disappearing rapidly in our modern buy cheap and throw away society. There are actually three components to our venture. First, there is the art studio. The following pic is a panorama shot of this area. This was originally Vickie's painting studio but she "generously" offered to share the jewelry bench area with me. (Actually, I moved my stuff in when she was out shopping one day). 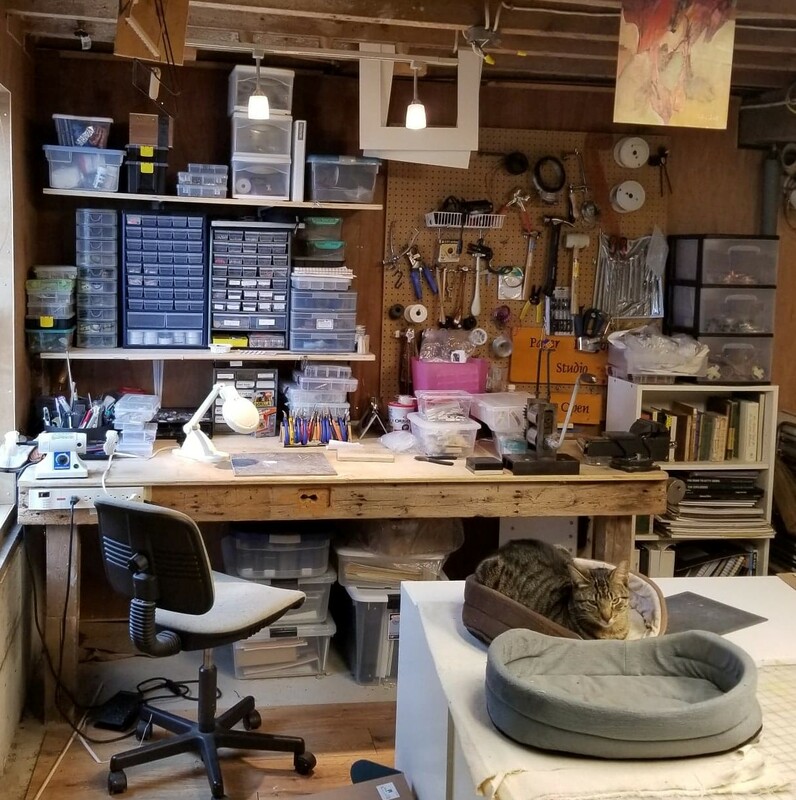 So here's a pic of our jewelry bench, complete with one of two studio cats. 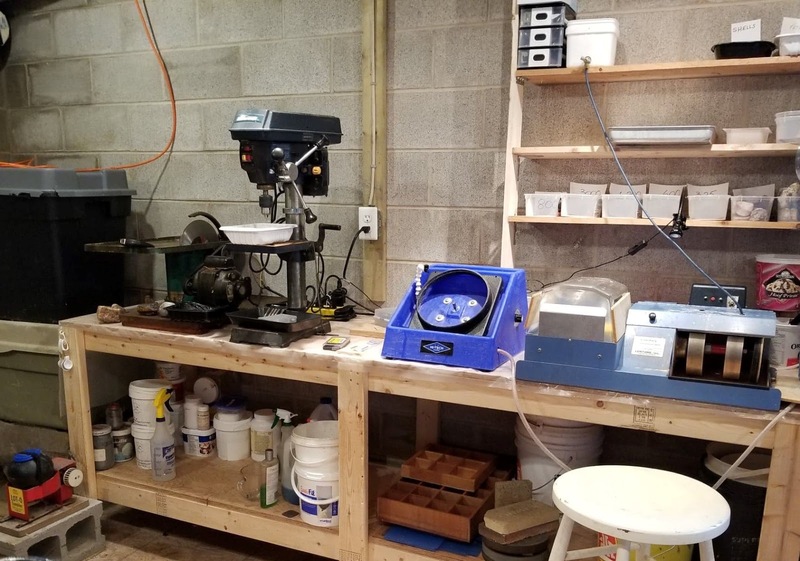 The second component is the rock lab where I do my lapidary work. Here's a panorama. And here's a close up of my 50+ year old Mercury grinder/polisher and my Rock Rascal trim saw. 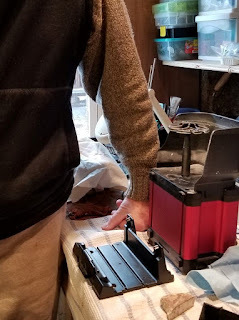 On the other side is my Lot-O-Tumbler (vibrating), 10 inch Mercury saw, drill press, slant lap and trim saw/ grinder. When you visit, if you are interested in seeing these areas, just ask and if we aren't busy we'd be happy to show them to you. The focal point of our venture is the retail shop and as I said earlier, we've packed a lot into a small space!. Here are some shots. 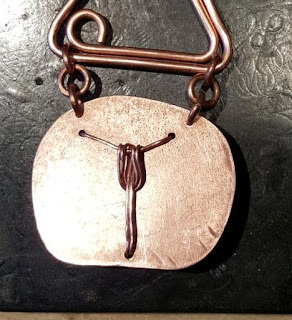 So that's The Artists' Mark- a great place to show the kids how rock gets shiny, art and jewelry get made and where everybody takes home a free piece of "The Neck"! 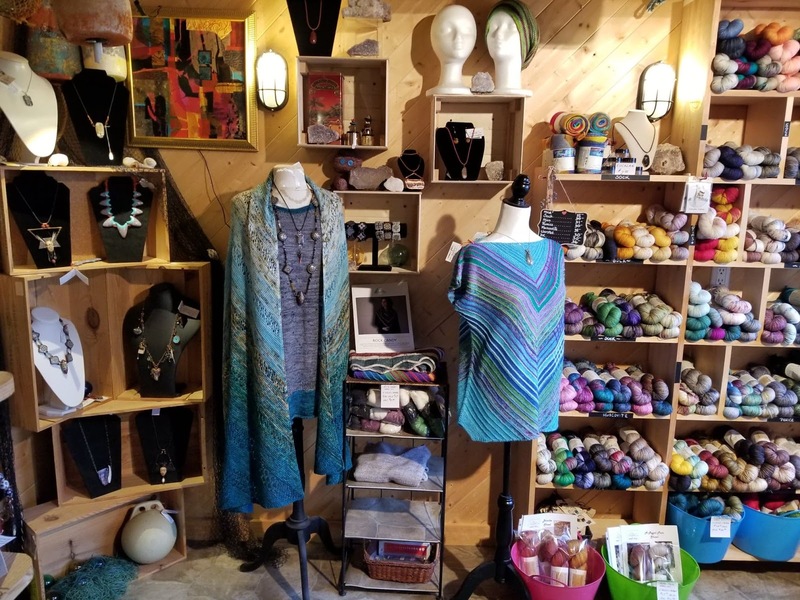 Oh, and a great place to buy a truly unique piece of jewelry and the most gorgeous hand dyed yarn in the world! We can't wait to show you in person. This Magical Place Called "The Neck"
I am writing this post mostly for those who intend to visit the area but even if you don't, this may be of interest to you. 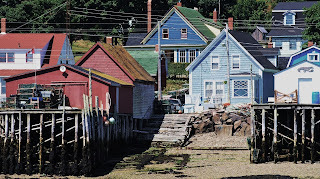 Digby Neck is a small strip of land sandwiched between the Bay of Fundy and St. Mary's Bay in western Nova Scotia. It is actually a chain of three distinct land masses that were once all connected but over hundreds of millions of years have become separated by cataclysmic geological events. It is these events that have produced the conditions that make The Neck so special. Scenic coves and headlands dot both shorelines and the cracks in the basalt have been filled by colourful silicates such as agate, jasper, quartz, amethyst and carnelian. When you drive up The Neck on highway #217 (one road in and out) you are retracing the steps of ox carts that initially carved out the route. In fact, everywhere you look, you see The Neck through the eyes of history. Wharves that are now crumbling once hosted large commercial sailing ships. 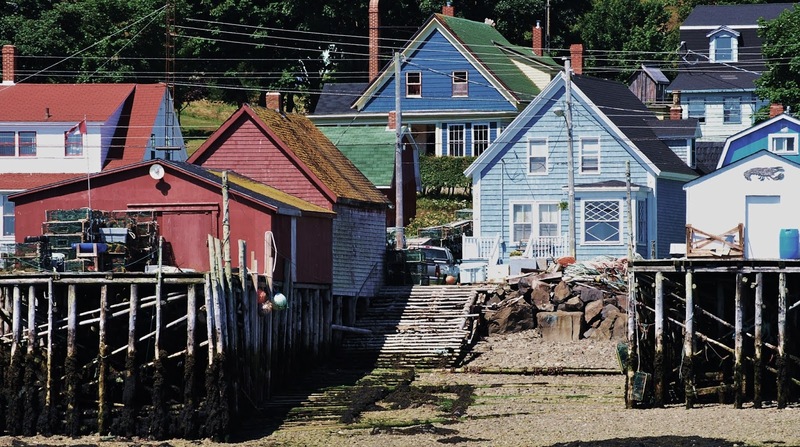 Sleepy fishing villages were once thriving hubs of activity before the depletion of the fish stocks and the remnants of old fishing weirs stand as ghostly sentinels to the past glory. The scenery is spectacular whether you are on land or on the water watching whales breach right beside your boat. And the people are friendly and delighted to let you in on our secret paradise, whether it is for a day or, as some have chosen, a lifetime. If you come, I hope you stop by my shop in Rossway and I can share my insights on the amazing geology and geography. I might even cut a rock while you are here. In the meantime, I want to introduce you to three amazing resources that will make your visit much more interesting and enjoyable. 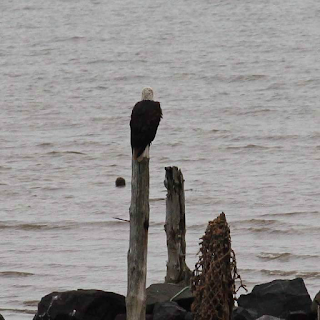 We now have a dedicated web site for The Neck. 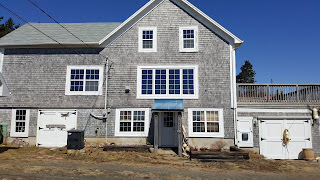 It's found at www.digbyneckandislands.ca and has been created by Jon White, one of the many who have fallen under the spell of the place and now call it home. 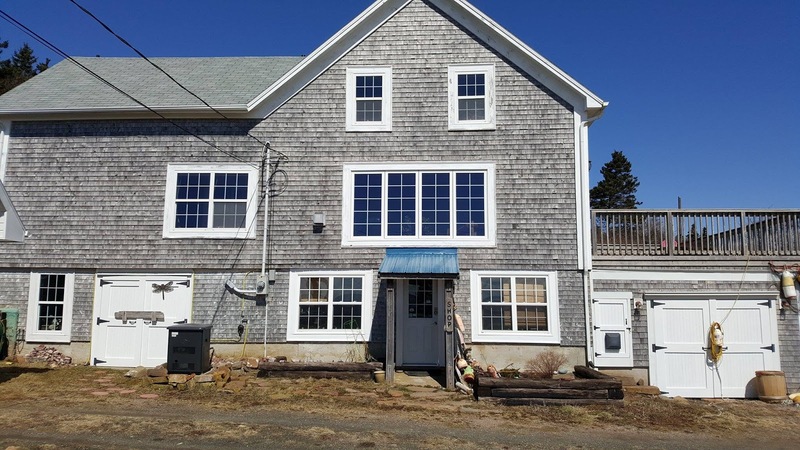 Check out his air B&B called The Mermaid House in Little River! 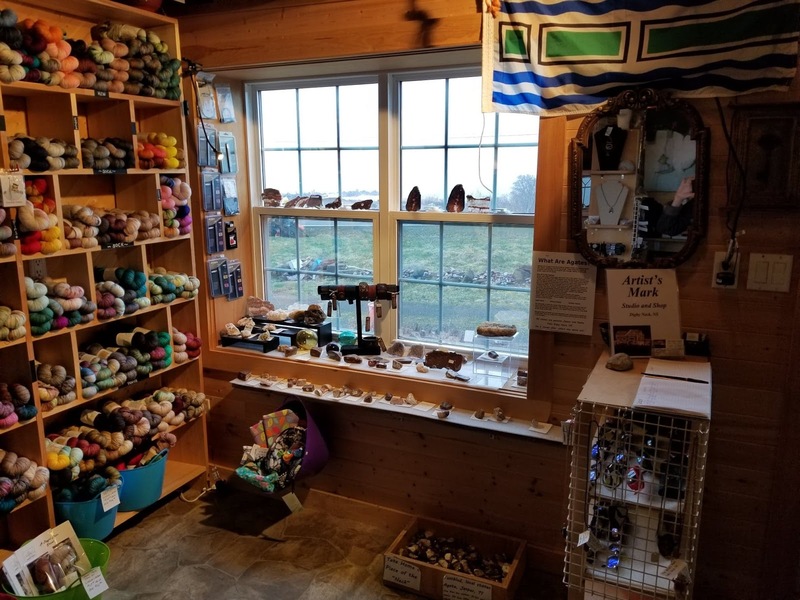 This web site will answer pretty much any question you might have on the area and lists many attractions and resources (including my shop!). If you want to get a feel for what makes The Neck special, do a google search on The Last Weir and take the time to watch a short film produced by Tim Wilson. It will give you a very personal and close up insight into who we are and how our lives have changed through time. And if you want even more historical perspective, check out www.heritagehub.ca where you can access a wealth of historical information including old maps, pictures and even interviews of people who have spent their entire (and sometimes long) lives here. Visit these three resources and you will absolutely have to pay us a visit! 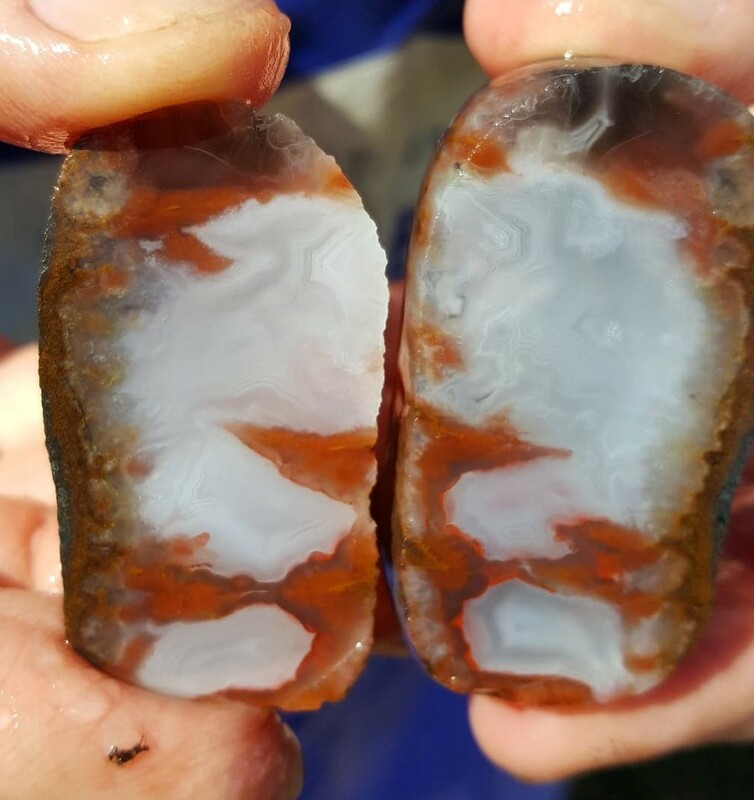 The "Agate Eye" is Back! We have had a pretty lousy spring weather wise but things are starting to look up. 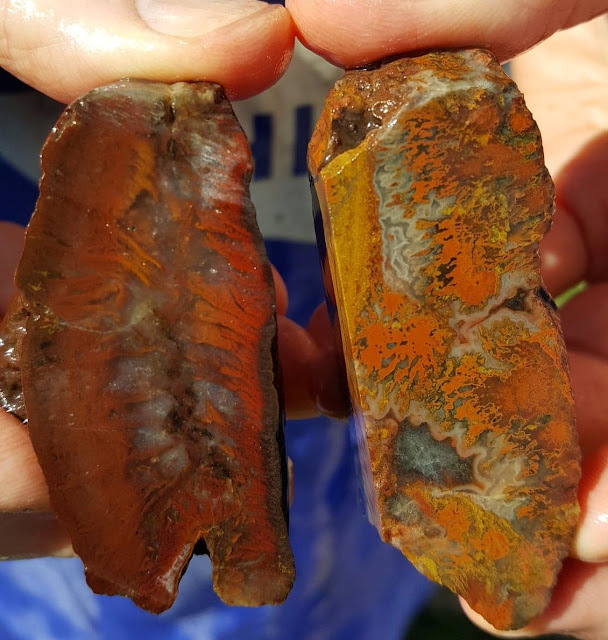 It was good enough today for the "Agate Eye" AKA Vickie to do a little hunting and here are a few of her finds that I had time to cut. There is amazing patterning here that reminds me of Digby Neck itself. I love this stone and am already planning some beautiful pendants. 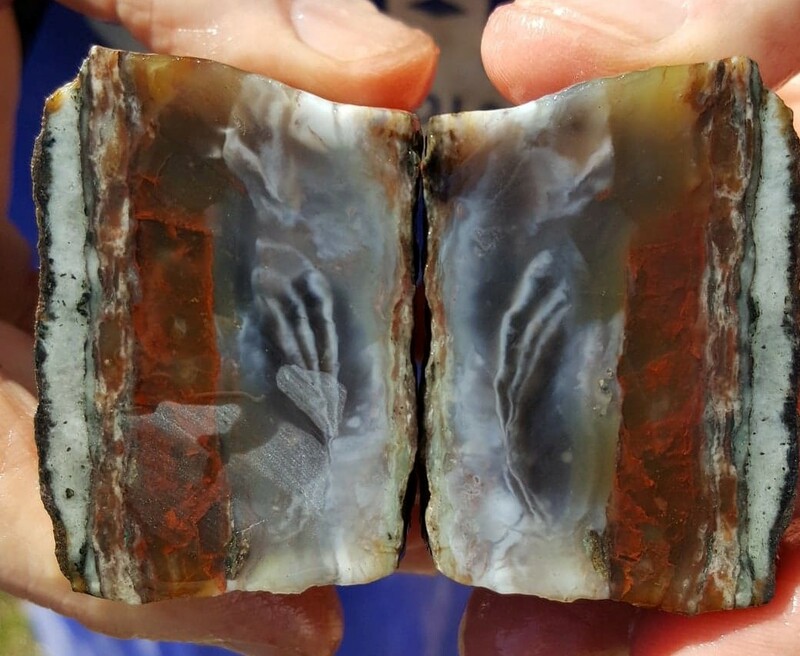 Great flame patterning on the left and a beautiful combination of fortification and moss agate on the right. Stay tuned because over the next few days I will be doing a post showing what the shop will look like this summer. I am very fortunate in that I have a lot of beautiful stone to work with so often my biggest problem is deciding which one(s) to choose. Recently I was cutting some slabs to use for guitar picks (I'm working on a batch of 44 and they are going to be spectacular!). Being somewhat "frugal" I tried to get as many out of each beautiful agate slab as possible but there was a piece left over that was large enough to use to develop a pendant and here it is. 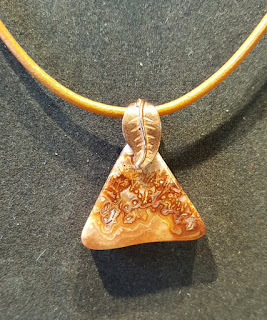 I just love this stone. The colouring and patterning are amazing but it is the live (natural) edge that does it for me. To me, that edge takes it to a whole new level of beautiful. I am also working with an amazing piece of petrified wood. 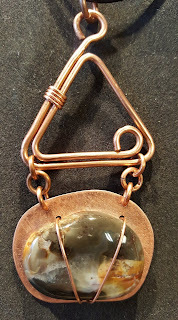 I have glued it to a distressed copper plate and will now wrap it with copper wire through the holes around the stone. In this picture you can clearly see the growth rings but in other light it is jet black. But again, the part I like the best is the live edge on top and to the left. It adds an amazing contrast when seen from the side, regardless of the light. Conversely, other stones need to be worked more to develop their full potential. 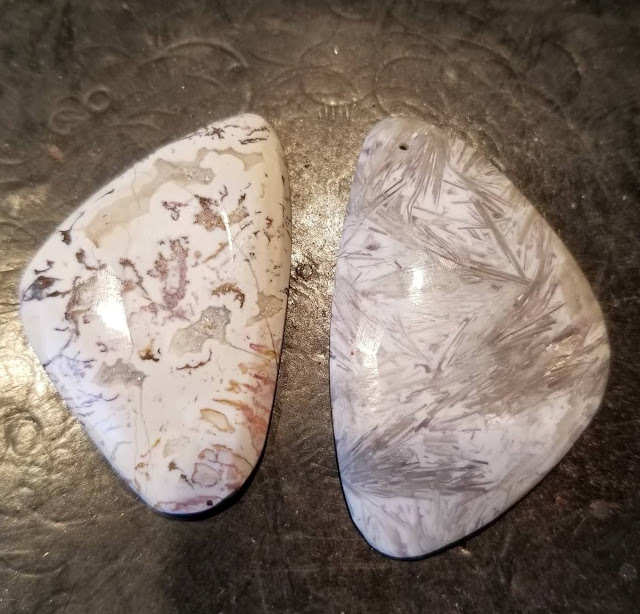 Here are two local stones that I have shaped in what I hope are shapes pleasing to the eye and then contoured so the natural patterns etc. show to their best. On the left is a nice piece of crazy lace with some crystal (druzy) pockets that I have enhanced by using curvature. This one will eventually be mounted to a copper back plate. The stone on the right is what we call Straw Agate. 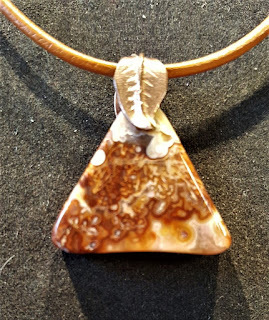 It can vary from dark to light in colour but this lighter piece really shows off the patterning which is even more enhanced by the curvature. 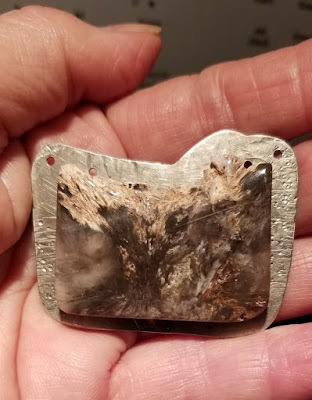 This one has been drilled and will probably just hang from a silver jump ring so the amazing stone takes center stage. 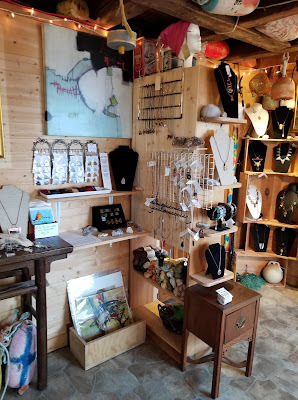 So as you can see, we have plenty of new pieces in the shop. 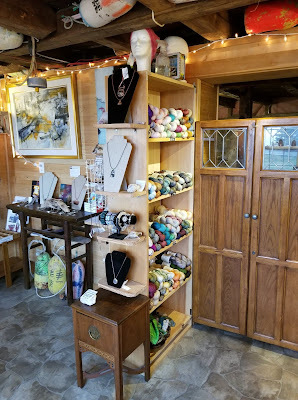 And speaking of the shop, our sign is back up and we will be officially opening for the first time this season tomorrow- Friday, March 22 so if you are in the area, drop by and say hi! I have finally had a block of time to finish off most of the pieces that I had started on. As you can see, they vary from simple to complex. This next piece is more complex but again showcases a beautiful local stone. 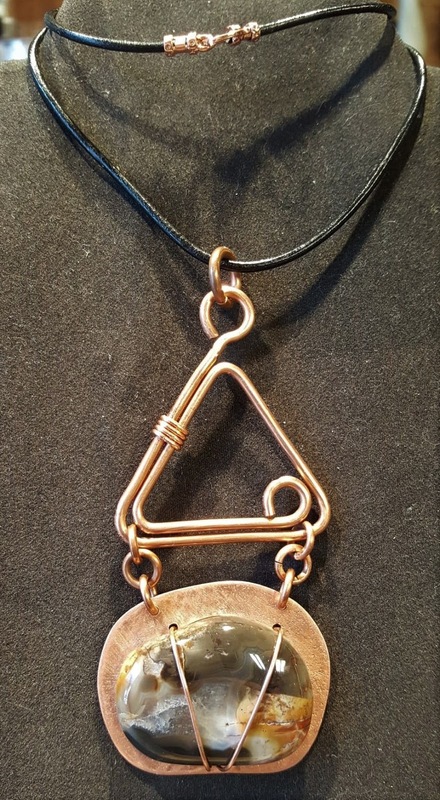 All the copper work is hand made. 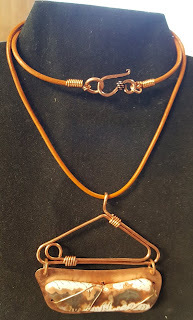 Since I was using a thicker copper wire as a design element, I had to come up with a neat way to make the connection at the back so here's how it looks. 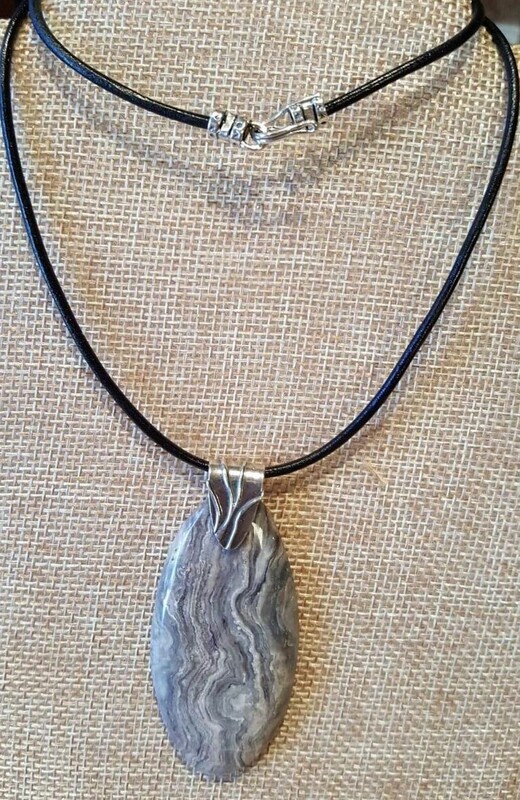 Then there is this beautiful piece of petrified wood from the Petrified Forest in Arizona. 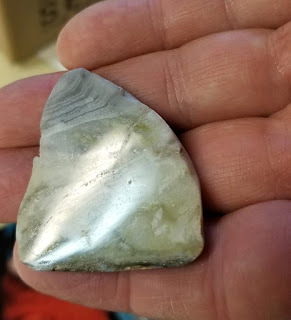 My friend Glen, who is from the area, gave me the slab and it polished beautifully. 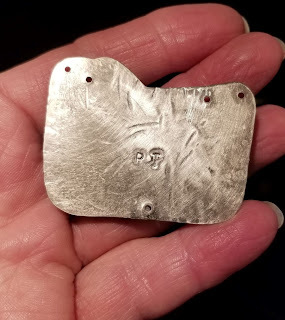 Up close the patterning is awesome and since it is a relatively large piece (2.5 inches) I kept it simple and elegant with an antique sterling silver bale and clasp. 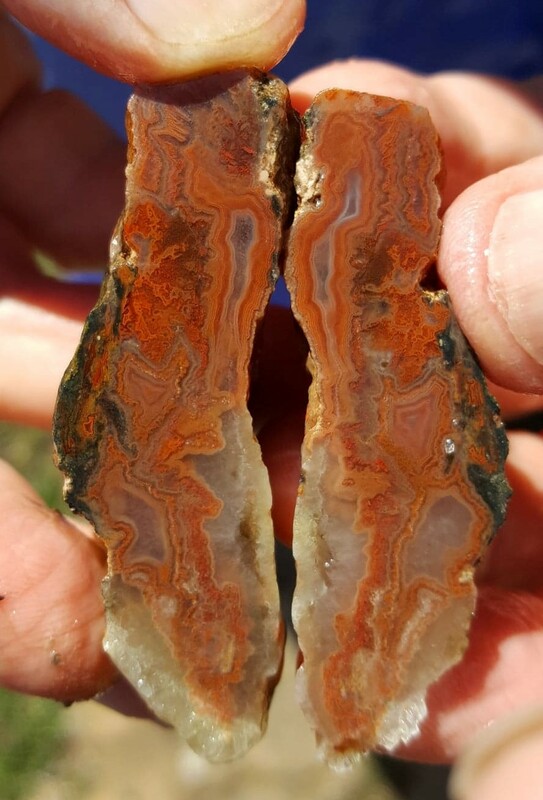 This next stone is amazing with stunning colour and patterning. 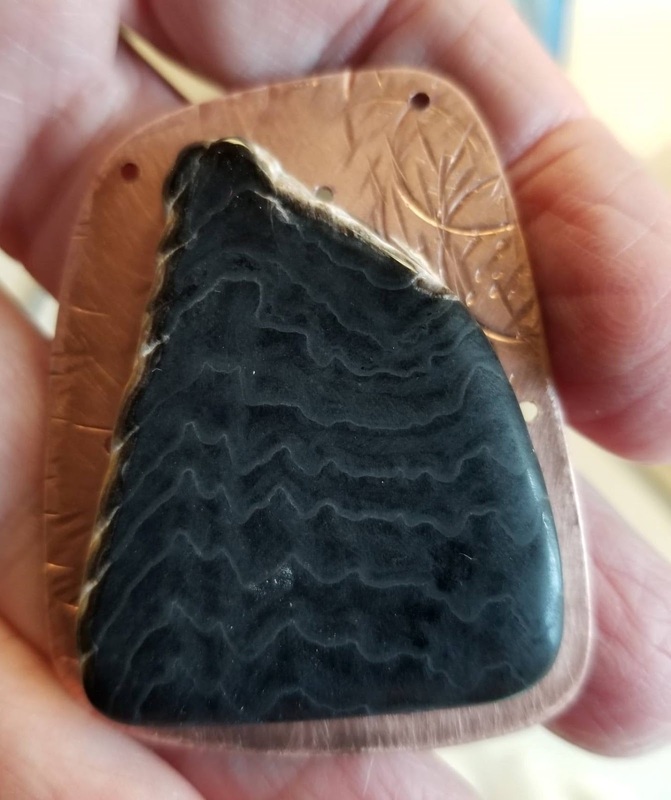 The patterning in this local stone kind of makes it look like Digby Neck and I showcased it with some hand made copper work. 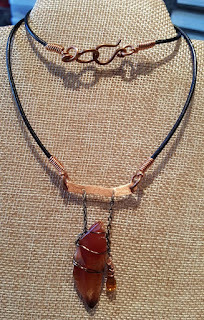 And finally, here's a gorgeous piece of local carnelian. 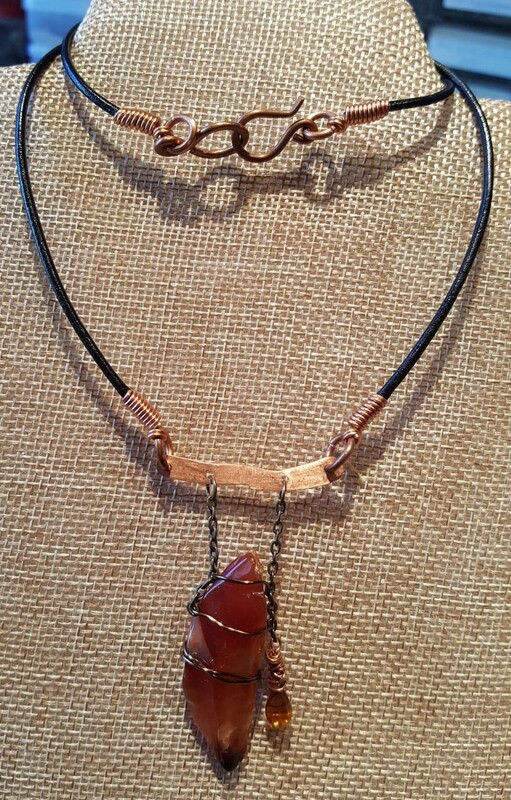 I love carnelian, especially banded as this piece is. The colour was so beautiful that I didn't want to lose one bit of the stone so I just left it free form and tumble polished it and attached it to a bit of hand made copper work with a glass bead for balance. In the upcoming weeks, I plan on trying some new techniques so stay posted. Also, we are pretty close to being able to offer pieces for sale on the Seawall Fibres web site so check the blog as I will post it when it happens. Like many others, I have difficulty working in my rock lab in the winter months. I have an industrial heater but can't leave it on when I'm not there so water tends to freeze and wheels don't turn like they should. 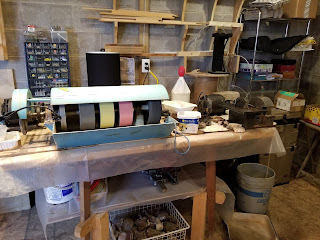 My daughter, Lisa, has used a machine called a Jooltool in her work with polymer and precious metal clay and since she is so busy dying yarn for Seawall Fibres she sent it to me to try because it can be used anywhere with no mess. Here's what it looks like. It is basically a rotating spindle to which you attach these "ninja" type wheels which vary in coarseness from about 100 to 50,000 grit. You work the stone from underneath the wheels but when they are spinning, you see the stone perfectly because of the gaps. here's mine set up on my bench. As you can see, it doesn't take up a lot of space. I worked on it for a few hours this morning and was surprised at the lack of dust, especially since you don't use a lot of water. And it doesn't make a lot of noise- perfect for indoors. 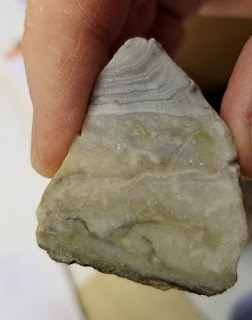 To test it, I took a stone that I had cut but not worked at all. Honestly, I was pretty impressed! I also did a bit of shaping and it worked well. So then I tried it on a specimen piece that had previously been worked to 325 grit on my slant lap. Here's a video of the finished product. So here's my assessment so far. 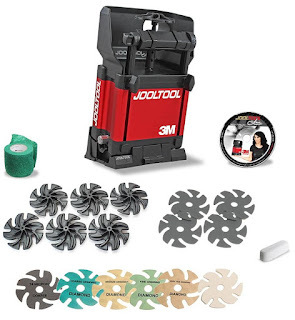 If you don't have much space, you could do a lot with this machine. The same goes for those who live in northern climates and can't work in their usual manner. It is a real advantage to be able to see the surface of the rock while it is being worked. The Jooltool isn't cheap- in fact, it's quite expensive. Buying the basic set up needed for lapidary will set you back $1300 Cdn. plus tax. 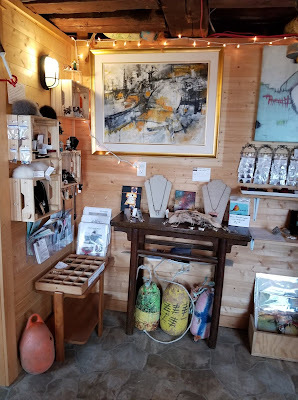 But I have to say that if, like me, you have serious cabin fever and need to work on some pieces, I actually think it is well worth it. A lot of thought has gone into the design and it is incredibly well built. So check it out on line and keep checking my blog because my next project will be to make a domed cab. As always, I'll be perfectly honest in my assessment. And if you want to see it in person, contact me and I'll set something up. P.S. 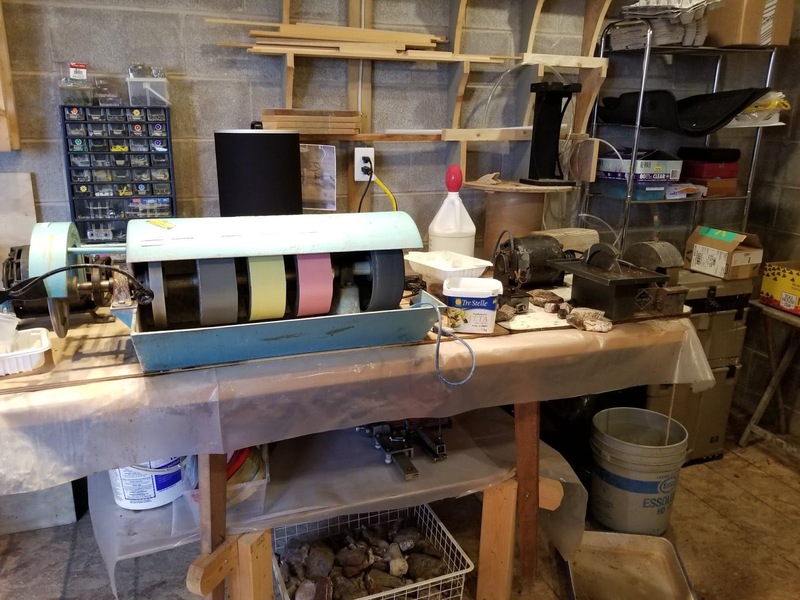 I am not a dealer for this or any other lapidary machine. I thought some of you might be interested in how some of these pieces are designed and made so I'm going to go through this one step by step. 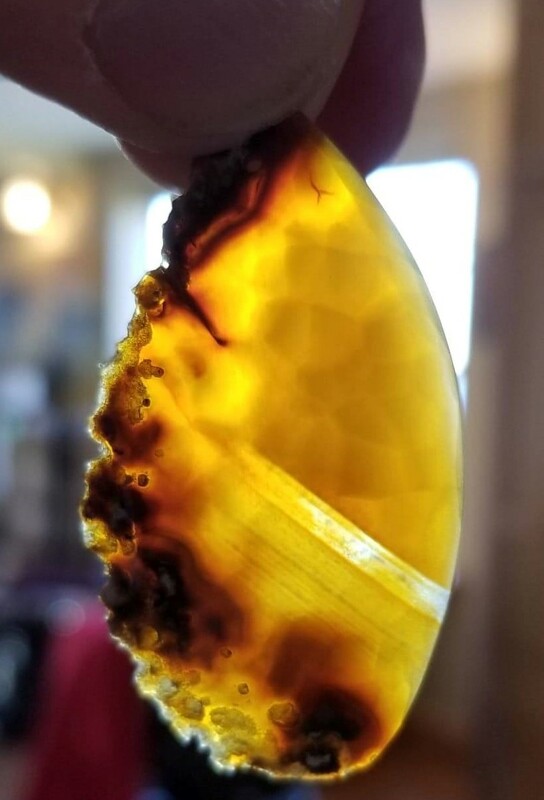 It started with a beautiful piece of local straw agate that had an irregular shape and beautiful live edge. So we decided to mount it to a sheet of German Silver that was cut to reflect the stone's shape. 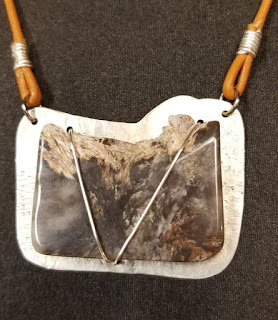 The plate was distressed and holes were drilled to allow for wire wrapping and jump rings to attach a cord. Both sides of the plates were distressed. The stone was then glued to the plate using clear Gorilla Glue and left to set overnight. The next day, German Silver wire was used to wrap the stone to keep it from moving in any direction (in theory, the glue should do this but you never know...). The back shows how the wire has been secured and tightened. 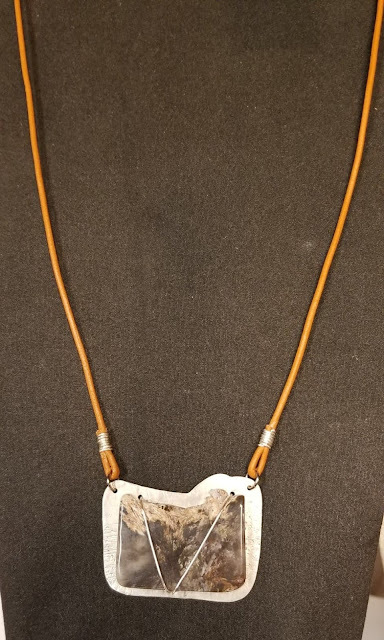 Then we chose a beautiful premium Greek leather cord and decided to use a very labour intensive method to create "eyes" in the leather by wrapping them in German Silver wire to match the stone wrapping. 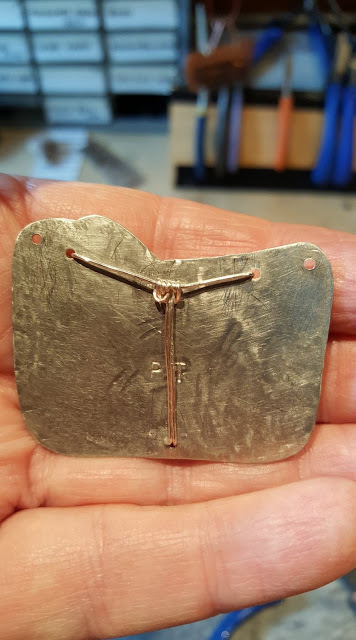 The cords were then attached to the plate using a German Silver jump ring. 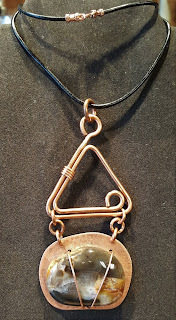 Finally, I used a premium silver clasp on the other end of the leather cord and the piece was complete! So waddya think? 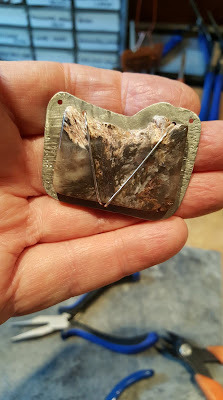 I love mounting stones like this and will post more on the blog in the days ahead. And if you want to see this piece in person, just come by the shop.